Depending on how you want to look at it… it’s been eight years since the Jets made the playoffs, but it’s been since 1996 since Winnipeg has seen the post-season. April 16 is the first match-up for the Anaheim Ducks and the Winnipeg Jets, and the Ducks have the home ice advantage. 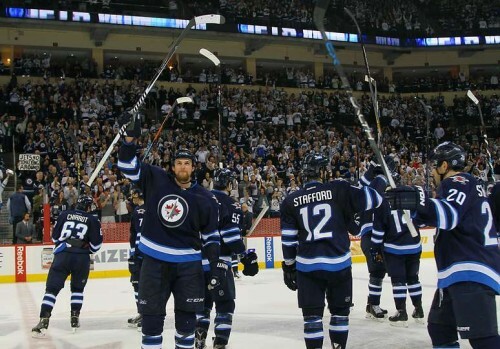 Luckily, the Jets will have the electric, insanely intense atmosphere at MTS Centre for the third and fourth games. While the last and only time this organization has seen the playoffs, they were still the Atlanta Thrashers and were defeated in four games by the New York Rangers. This time around can be so much different. The last time they were in the playoffs, the roster included Marian Hossa, Ilya Kovalchuk, Marc Savard and plenty of other potential powerhouses and they weren’t able to make anything happen… at all. This time, with a lot less of a stacked roster, the Jets will take on the Ducks and hope for the best. Despite the fact that this season has been injury-filled for many of the top players, the Jets having Tobias Enstrom back on the ice can be an advantage. He has been having issues with injuries ever since the team’s last season in Atlanta, but hopefully he will be good for the duration of the playoffs. Also back from suspension, Byfuglien should be another huge asset for the Jets, since he is predicted to be the most useful throughout the series. In the post-season with the Blackhawks, he played a major role having scored 11 goals, 3 of which in the Finals. Even though he is a defenseman with the Jets, they’ll still need him to be as productive in one way or another. According to my bracket, the Jets will win the series in 7 games… we’ll see how that goes.